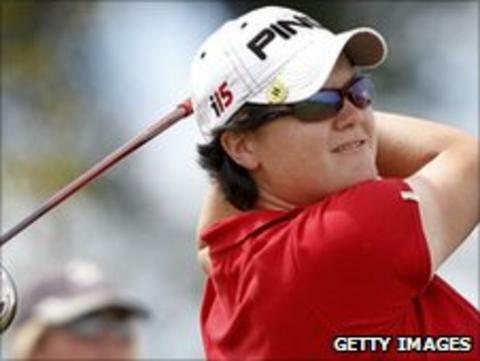 Wales' Becky Brewerton has said she hopes plenty of practice will benefit her bid for the Women's British Open title at Carnoustie. Brewerton golfer tees off at 0736 BST on Thursday morning on the Scottish links course. She will have the company of Brittany Lincicome of the USA and Japan's Yuri Fudoh in the opening two rounds. "[It's] a really tough golf course we're playing this year at Carnoustie," said Brewerton. "I came down a few weeks ago for a practice round. "I knew it was one of those courses I'd probably have to come and play before the actual week of the tournament just to get a better feel for the conditions. "I'm glad I did. I've now played the course three times before starting. I think it's good to have got as much practice in on it as possible. "I'm definitely feeling confident going into this week." The only other Welsh representative at Carnoustie, Becky Morgan, begins her bid at 1243 BST along with Germany's Anja Monke and Belen Mozo of Spain.